Many of my Chinese recipes are handed down by my mum. Whenever I’d like to have a Chinese dish on our table, I always turn to my mum and try what she cooked for us. She likes to make fish cakes, blended with shiitake mushrooms and dried prawns (dried shrimps), that could be traced back to her family’s heritage. My mum said, the choice of fish meat is crucial. The fish has to be very fresh, without any fishy smell at all. A pinch of pepper and a bunch of diced spring onion will add a kick. The fish cake can be eaten on its own. What a sensational taste when the springy pan-fried fish cake pops into your mouth, comes straight from the pan and still hot. Dip with some chili sauce if you like a spicy kick. In Hong Kong, people like to choose Mud Carp (鯪魚). Unfortunately, I can’t find any in Australia here. So I used mackerel (馬鮫魚) that’s also a good choice of making springy fish cake. As for bok choy, try to get the kind with shorter stems if you can. That’s the best kind with sweetest taste. Rinse bok choy and drain well. Cut into sections, about 4cm (1.5 inch) in length. Separate stalks and leaves apart. Soak dried prawns, shiitake mushrooms and vermicelli in warm water until softened. Finely chop dried prawns and shiitake mushrooms into cubes. Cut vermicelli into three sections. Set aside. Heat 2 tablespoons of oil in a non-stick pan or wok. Add fish paste, lightly press and flatten the fish paste, to get a disc about 0.5 to 0.7cm (0.5 inch) in thickness. Pan fry the fish over medium heat until both sides are golden brown. Transfer onto a kitchen paper to absorb access oil. Let cool a bit. Cut into small pieces. Set aside. Add some oil in wok or pan. Saute ginger over medium-high heat until fragrant. Add stalks of bok choy and stir fry until soft. Add leaves and continue to stir fry, followed by chicken broth. Season with salt. When the bok choy is almost done, add vermicelli. Let vermicelli absorb sauce. Replenish more chicken broth or water if necessary. Cook until vermicelli is softened. Toss back fish cakes, add thickening and cook the consistency to your liking. Dish up and serve hot. The dried prawns I used were very large one. Each was about 5cm (1 inch) long, meaty and very fragrant with high quality. They are not the same as the small ones, called 蝦米 (xiami, literally means dried prawn as small as rice). I love boy choy, looks so delicious but I don't think can get this type of dried shrimps here. Will use the normal type. 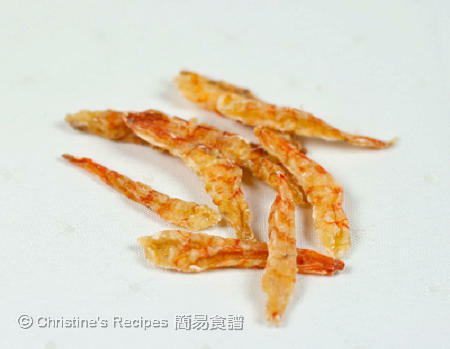 I"ve not used dried prawns before, and not because I was not intrigued, I am very much so, just didn't know how to do it. Previous attempts had too strong of flavor. Looking forward to following a recipe of a master. Hmm the fish cake made from mackerel looks great. I believe it is capable of beating the carp we usually have. Wow, the fishcake looks good! Nice crunchy bok choy! Christine, your Mom is such a good teacher! I've seen fish cakes in stores and restaurants but never thought it could be made at home! They look really delicious and healthy too! I like how you do the fish cake with the veg and glass noodles. Lovely dish. It's great to have a mother who teaches you how to cook and then you're passing your knowledge to your daughter. In my case, it was my dad. The fish cakes sounds good with all the authentic ingredients. 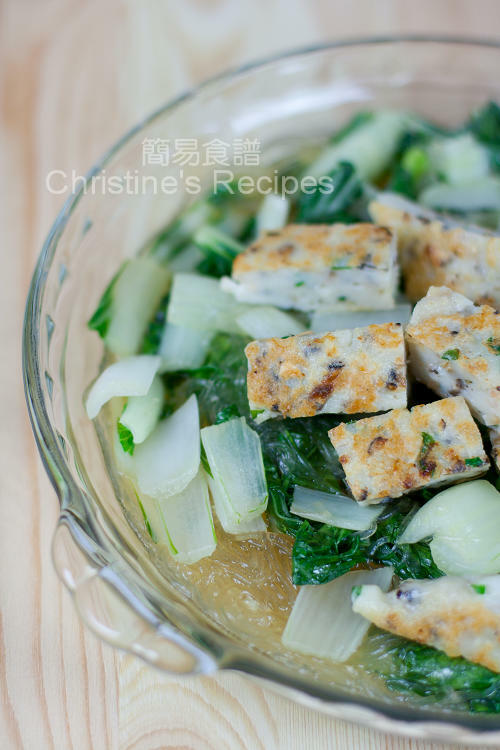 Christine, thank you so much for the tips on the ingredients for making fish cake -- FRESH and 100% "fishy!!" I've been dying to try making fish cake from scratch after seeing a few other blogger friends did it! Thank you! I shall take your and your mom's advice into consideration when the time for some fish cake making! is it ok to use frozen mackerel? it's very hard to find fresh mackerel here. My favourite dish again. I love bok choy. Just bought 2 packets from the Chinese shop yesterday. Your fish cakes look very delicious. I love them in soup, too. oh my great fishcakes....so lovely!! Love the fishcakes here and the whole dish sounds fantastic! 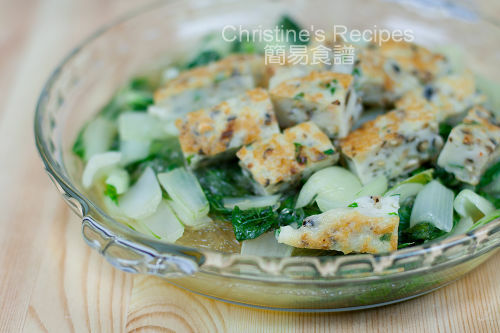 Wow, nice fish cake dish...love it with lots of bok choy...nice pictures! Hello Christine! Brussels calling!! What a refined & divine dish!! I loved this dish, we had it for supper tonight, and it was delicious. I will surely create this again when I have time. Thanks! Not all White Fish can be used.. At the place I used to work at there was a surplus of COD and we tried to make fishcake with this but it doesnt work at all.. 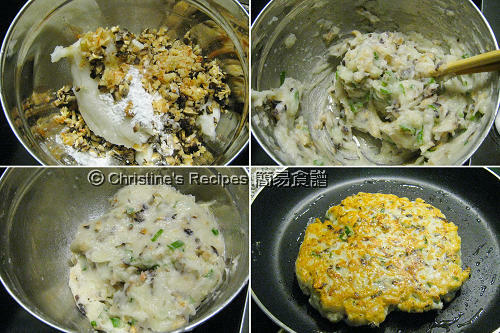 Yes, I found mackerel's the best to make fish cake and used for many years.